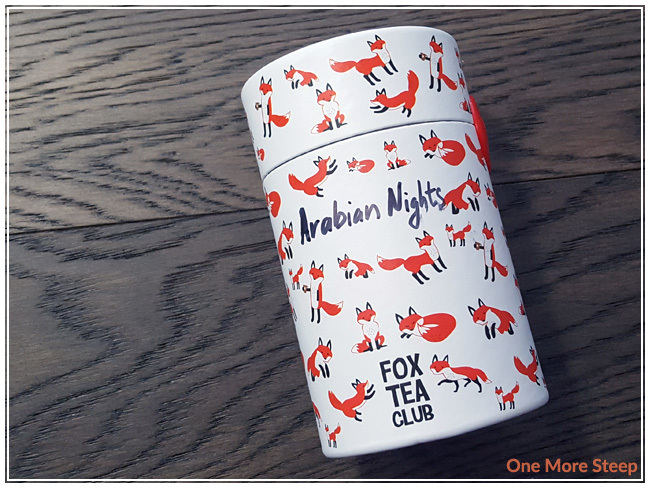 Fox Tea Club has provided me with Arabian Nights for the purposes of providing an honest review. I was eager to try Fox Tea Club’s teas after seeing some of their photos on their Instagram account, and was pleasantly surprised by the variety of teas they sent me to try! 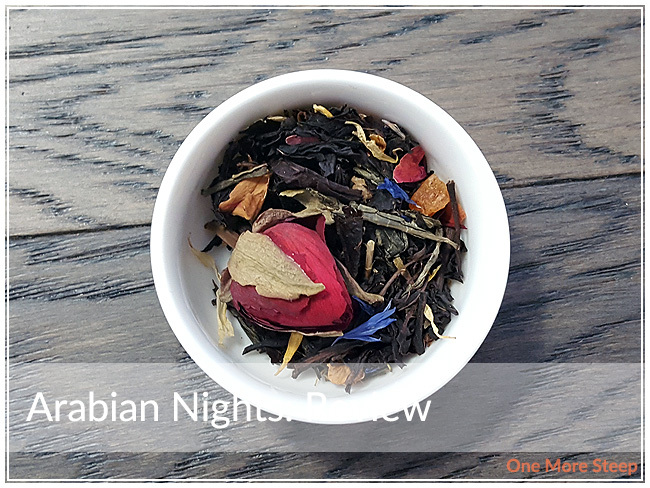 This first review is of Arabian Nights, a black and green tea blend. First off, I just want to saw how cute their packaging is. Arabian Nights came to me in a fox print cardboard cylindrical box. 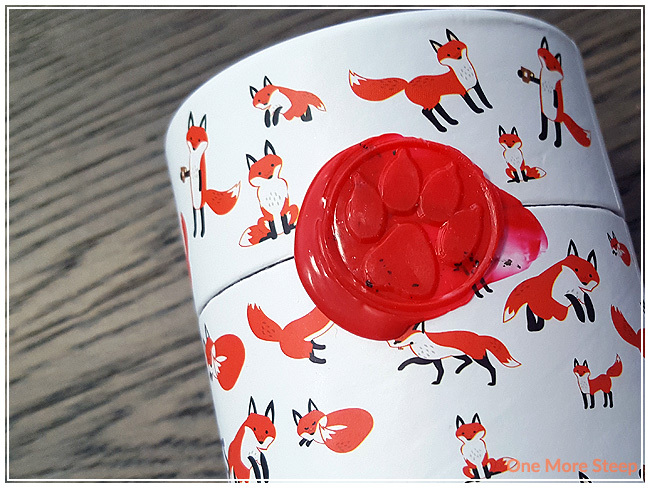 The name of the tea was hand written and it is sealed with red wax with a fox paw print – how adorable is that? The dry leaf of Arabian Nights is quite sweet smelling, and has hints of tropical fruit. There’s some floral notes as well, and I can definitely make out the smell of roses from this tea that mingle well with the fruity aromas. Arabian Nights is made up of: black tea, calendula, cornflower, green tea, mango, pineapple, rose. The packaging of Arabian Nights didn’t offer any suggested steeping instructions, neither did the online product page. 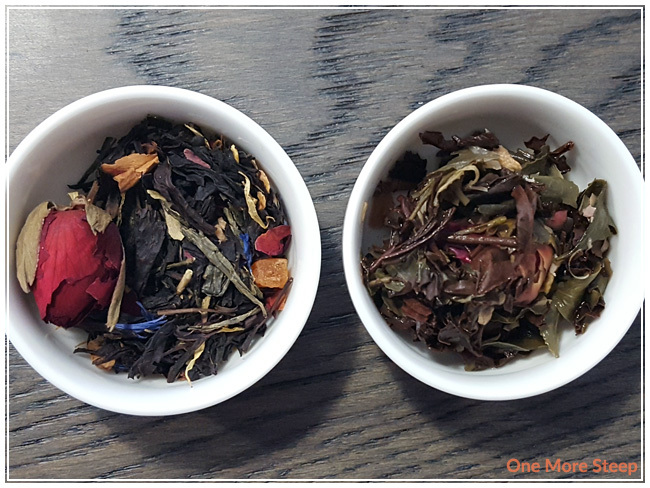 One thing to consider when steeping a tea blend is what tea varieties are in the blend. In the case of Arabian Nights, there’s black and green tea. 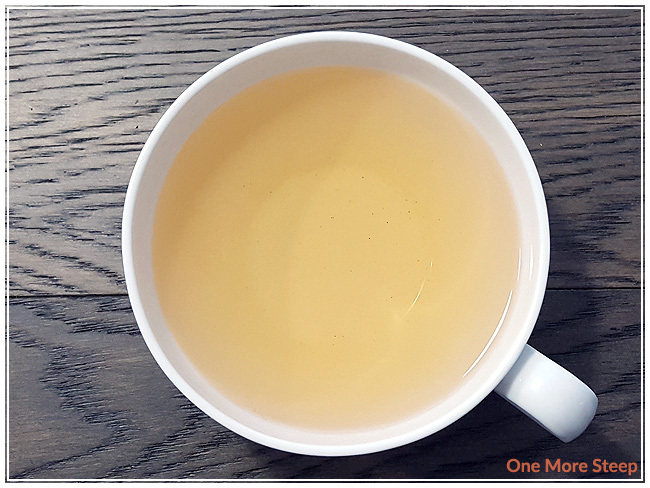 While I would normally steep a black tea in 100°C (212°F) for about 4-5 minutes, a green tea should be steeped in much cooler water (80°C/185°F) for less time (1-3 minutes). Arabian Nights steeps to a nice golden orange. The product page for Arabian Nights suggests that the tea should smell like vanilla and cake, unfortunately I don’t get that experience. However, this tea is delicious in it’s own way. I would describe the steeped tea as having a sweet, fruity aroma. I found that the rose smell kind of mingles in with everything, but isn’t too overpowering. I can just make out the black tea base under the fruity-rose blend of aromas. On first taste, I get a touch of sweetness and can taste the mango, the black tea, and the roses. The tail end of each sip has a remarkable crisp sweetness that reminds me a lot of apples. I resteeped Arabian Nights twice (increasing steep time by 30 seconds for each additional steep). For the first resteep, I found that I was getting most black tea and rose in the flavour. That delicious tropical fruit flavour was mostly gone and it was a bit disappointing. I still cannot taste the green tea. For the second resteep, I was still getting mostly black tea and rose. I would say that the first steep is the best. I liked Fox Tea Club’s Arabian Nights. I think that this tea is really pretty – any tea that includes rosebuds always make me feel a touch more romantic purely because of the addition of rosebuds. For me, the initial steep was the best because it had the most complex flavour profile with the full effect of the tropical fruit, roses, and black tea base. Unfortunately, I think a lot of the ingredients overpowered the green tea leaves that were present, so I couldn’t really taste them. 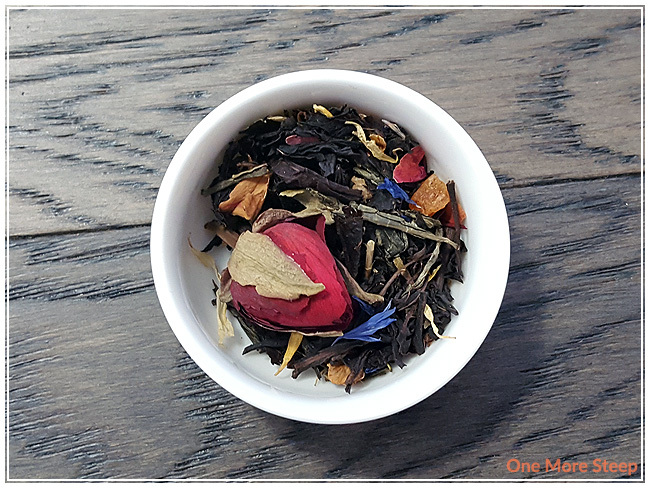 Because of the fruity notes, I think this tea would make an excellent iced tea, if you were so inclined, and that the tea itself was quite good by itself as the fruit flavours added plenty of sweetness by themselves.